The Effectiveness of the UN Human Rights System: Reform and the Judicialisation of Human Rights’ (Routledge, London/New York, 2017). International Watercourses Law for the 21st Century: The Case of the River Ganges Basin, (Ashgate Publishing, UK, 2005). 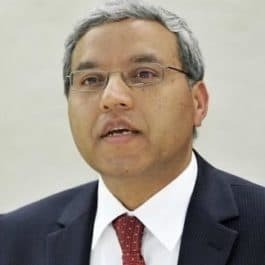 ‘India’s New Bilateral Investment Promotion and Protection Treaty with Nepal: A New Trend in State Practice’ ICSID Review: Foreign Investment Law Journal (Oxford University Press), Vol. 28 (2), Fall, 2013, pp.384-404. ‘The Challenge of Reconciling the Competing Principles within the Law of Foreign Investment with Special Reference to the Recent Trend in the Interpretation of the Term “Expropriation”’ International Lawyer (A journal of the American Bar Association’s International Law Section); Spring 2006; Vol. 40 (1), pp.121-141. ‘The UN Human Rights Special Rapporteurs and the Impact of their Work: Some Reflections of the UN Special Rapporteur for Cambodia’, 6 (1) Asian Journal of International Law (Cambridge University Press, January 2016), pp.1-14.